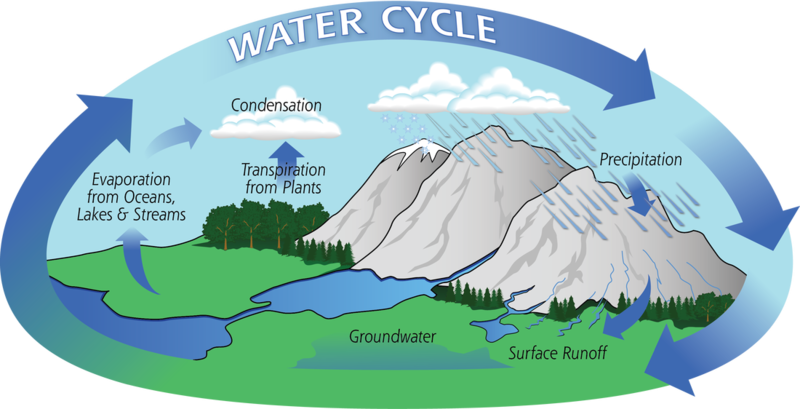 The water cycle is a continuous cycle of how water returns back to earth. The water cycle never ends and you could be using the same water that dinosaurs used millions of years ago. Water falls as precipitation. There are 4 types of precipitation; rain, snow, sleet and hail. The sun powers the water cycle. The sun heats up the water from rivers, lakes, and oceans and the water evaporates and turns into water vapor. The water vapor (gas) travels up into the atmosphere. As the atmosphere gets colder the water vapor turns back into water droplets as condensation. These water droplets form clouds and are powered by the wind. When the clouds get too heavy the water droplets fall as precipitation. The water falls as rain, snow, sleet or hail. When the water hits the earth it becomes runoff (water that runs down hills and mountains; water that moves on top of the earth's surface) or groundwater (water that gets absorbed by the ground and runs underneath the earth's surface) Both runoff and groundwater are similar because the water runs (moves) toward rivers and oceans.